In the pages of The Sociopath Next Door, you will realize that your ex was not just misunderstood. He's a sociopath. And your boss, teacher, and colleague? They may be sociopaths too. We are accustomed to think of sociopaths as violent criminals, but in The Sociopath Next Door, Harvard psychologist Martha Stout reveals that a shocking 4 percent of ordinary people-one in twenty-five-has an often undetected mental disorder, the chief symptom of which is that that person possesses no conscience. He or she has no ability whatsoever to feel shame, guilt, or remorse. One in twenty-five everyday Americans, therefore, is secretly a sociopath. They could be your colleague, your neighbor, even family. And they can do literally anything at all and feel absolutely no guilt. The fact is, we all almost certainly know at least one or more sociopaths already. 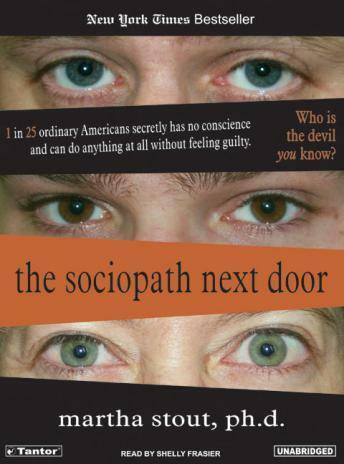 Part of the urgency in reading The Sociopath Next Door is the moment when we suddenly recognize that someone we know-someone we worked for, or were involved with, or voted for-is a sociopath. But what do we do with that knowledge? To arm us against the sociopath, Dr. Stout teaches us to question authority, suspect flattery, and beware the pity play. Above all, she writes, when a sociopath is beckoning, do not join the game. Yes; it's my lying, cheating, soon-to-be ex-husband (see book description)! This book was very enlightening. I wasn't certain until now that I could put a title to 'his' behavior; but this fits him to a tee! Some may find this book a little, 'heady', boring at times; I found it intriguing. There are, truly, sociopaths (without conscience) infiltrating our daily lives. As a novice, this book was a good primer on sociopathy. The author claims that 4% of the population in western society have no conscience which was pretty alarming. Most books that I have read on this topic deal strictly with violent criminals, but the author included stories and studies about nonviolent sociopaths which provides a more complete picture of the condition. My only complaint is that the narrator raises and lowers the volume of her voice too much. This might be nice stylistically, but it was a hassle having to adjust the volume while driving. As a clinician I enjoyed this book. It shows good examples of how Antisocial Personality Disorder is a spectrum, not all are Ted Bundy. Newer research and DSM diagnosic criteria now exists but the majority of the information is applicable and relevant. WOW!!! A great piece of work that educates, verbally illustrates, and just plain fascinates. This book explains away all the people who have brought so much misery to this man's life. I wish I had this knowledge when I was younger, and I am eternally grateful for having it now. You have to read this book! It is good awareness for everyone to have.